Today, on 15 April 2019, European Union Member States gave their final approval to the text of the copyright Directive as it was adopted by the European Parliament on 26 March. This vote in the Council of the EU was the last procedural requirement in the EU law-making process. Now the Directive, once translated and published in the Official Journal of the EU, will become law. 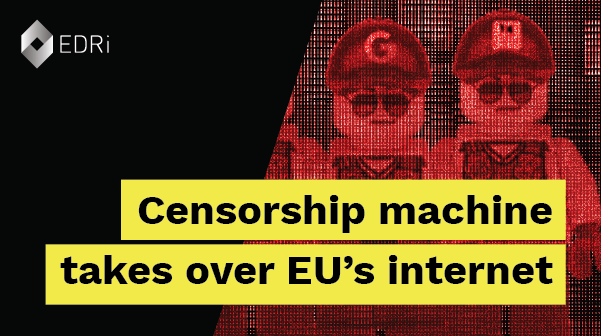 19 Member States voted in favor of the Directive and effectively ignored hundreds of thousands of people who went on the streets in Europe to protest against upload filters and a petition signed by five million people. Six Member States (Finland, Italy, Luxembourg, the Netherlands, Poland, and Sweden) voted against the Directive text, while three (Belgium, Estonia, and Slovenia) abstained, showing how controversial the text is. You can find the full results of the vote on the Save Your Internet campaign website. Member States will now have two years to implement the Directive in their legislation. The only way to prevent, in practice, upload filters for copyright purposes in the EU is to influence the national level implementation. To do this, we encourage you to support civil rights groups working to defend digital rights in your country! The post EU Member States give green light for copyright censorship appeared first on EDRi.